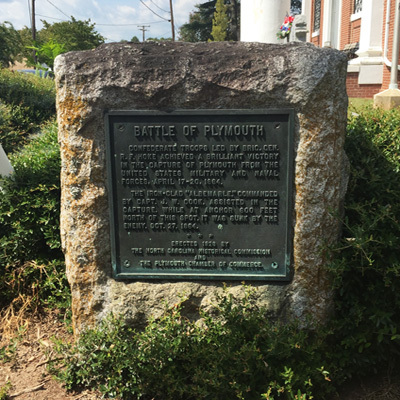 The Battle of Plymouth marker is a simple square bronze plaque attached to a large unfinished, roughly square, slab of rock several feet high. BATTLE OF PLYMOUTH / CONFEDERATE TROOPS LED BY BRIG. GEN. / R.F. HOKE ACHIEVED A BRILLIANT VICTORY / IN THE CAPTURE OF PLYMOUTH FROM THE / UNITED STATES MILITARY AND NAVAL / FORCES, APRIL 17-20, 1864. / THE IRON-CLAD “ALBEMARLE,” COMMANDED / BY CAPT. J.W. COOK, ASSISTED IN THE / CAPTURE. WHILE AT ANCHOR 600 FEET / NORTH OF THIS SPOT. IT WAS SUNK BY THE / ENEMY, OCT. 27, 1864. ERECTED 1828 BY / THE NORTH CAROLINA HISTORICAL COMMISSION / AND / THE PLYMOUTH CHAMBER OF COMMERCE. Josephus Daniels delivered the chief address at the unveiling exercises on June 19, 1928. In 1862 Union troops occupied Plymouth to control the mouth of the Roanoke River. These forces with the assistance of Union sympathizers, freemen and runaway slaves eventually constructed four forts to protect the town. During the second largest Civil War battle in North Carolina, fought April 17-20, 1864, Confederate forces retook the town with the aid of the ironclad CSS Albemarle only to lose it again a few months later. 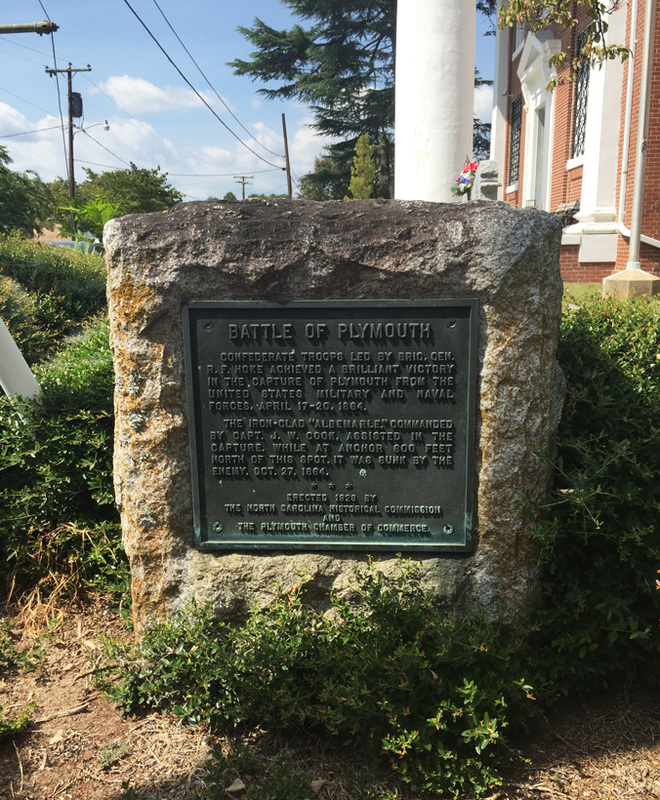 On April 27, 2014, another Battle of Plymouth memorial was dedicated to commemorate this important Civil War event. It is located near East Main Street and Rankin Lane at the Fort Compher historical site, Plymouth, NC. The memorial marker faces E. Main St., positioned near the street corner intersection with Adams Street. It is located at the corner of the courthouse building, at 120 Adams Street, Plymouth, NC. The Washington County Veterans Memorial is located in front of the Washington County Courthouse to the right of the main entrance. The marker sits on the front lawn of the Washington County Courthouse, surrounded by evergreen bushes.